Mrs. Sao Khea, 45, has learned about disaster risk reduction and how to overcome the challenges and minimize the risks caused by climate change. Family life has changed now, I can afford sending my children to school. Significant increases in temperature and changes in rainfall patterns are already having major impacts on people’s ability to provide food for their families. In Cambodia, recurrent drought periods and floods have become a major concern and a big challenge for many farmers. Long heat periods make accessing clean water from wells more difficult and the water scarcity has negative consequences on crops and livestock. It also affects the population's health, especially women and children. Mrs. Sao Khea, 45 years old, has three daughters and one son living in Kralanh village, in the Western province of Pursat. Because of climate change impacts, Sao Khea’s daily income has dramatically being reduced since 2012. Her vegetables and chicken died, which forces her family to labor selling for supporting family members’ basic needs. Thanks to the Support Organization of Rural Farmer (SORF), funded by Oxfam, Sao Khea learned about disaster risk reduction and how to overcome the challenges and minimize the risks caused by climate change. She has also learned how to create additional business and grow vegetables with less water. 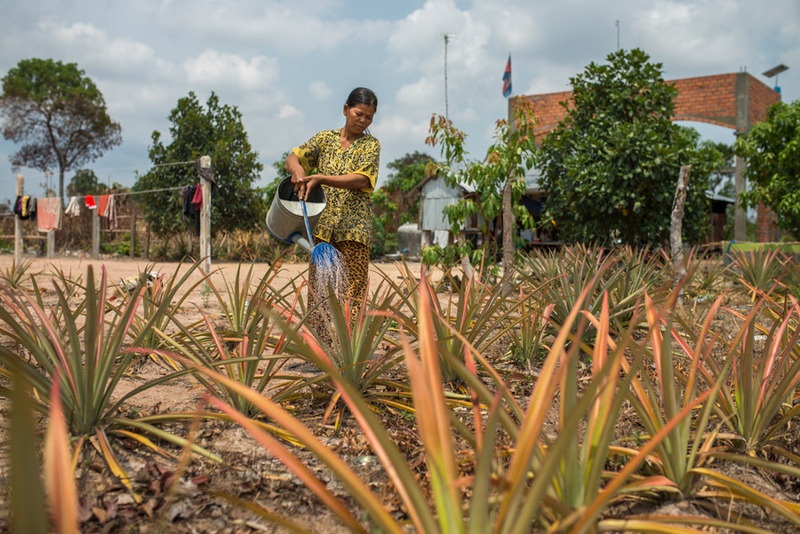 Sao Khea has been working very hard in growing vegetables and fruit trees that are resilient to high temperatures and floods such as pineapples, sugar cane, jack fruit and mango trees by putting into practice all her new agricultural and technical skills. She is also growing morning glory, water melon and other vegetables that she sells in the market getting an average of 20.000 riel (5$) per day. “Family’s life has changed now, I can afford sending my children to school; I bought bikes, clothes and school supplies for them," said Sao Khea. “In my future, I wish all my children and women in my community had the great opportunity to access to high education, balanced nutrition, health care and skills that help them to become more resilient and able to solve problems by themselves,” Sao added. A commitment to increase and accelerate public finance is adaptation’s bottom-line. Without it, the Paris agreement will be a mitigation deal for big emitters, not a climate change agreement for all. This briefing sets out Oxfam's demands on adaptation finance post 2020 that need to be agreed in Paris at the end of this year.